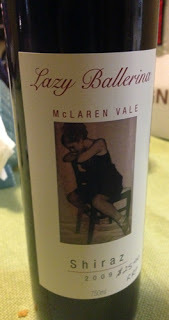 Lazy Ballerina is the winemaking project of James Hook, a McLaren Vale viticultural gun-for-hire who spends his working hours solving other people’s vineyard issues (you can check out some of his work on the DJ Grower’s blog) and as one of the driving forces behind the GroundswellSA anti urban sprawl movement. With this wine then James is going for old school McLaren Vale in a classic style – think open fermenters, basket pressing, hand picking, the lot. Traditional winemaking it is, yet with a modern attention, a worthy combination indeed. A combination which I think shows rather favourably in the final product too – polish meets craft. In fact the only quibble I’ve got with this Shiraz is the ripeness, with this Shiraz carrying that slightly scorched edge of the ’09 McLaren Vale vintage on nose and palate, the freshness slightly muted by warmth and dessication. Still, in it’s mould it’s a pretty smart wine, a thick and enveloping wine even, carrying the very essence of McLaren Vale Shiraz. That Vale essence character kicks off with a deeply concentrated nose, full of very rich, stewed plum, road tar and molasses on the nose and through the palate. It’s almost treacle like in its richness and red wine intensity, conjuring up images of a vineyard full of tiny berries that are chock full of power, if needing just a little more delicacy for big love. The palate too crosses between dried plum fruit and alcohol warmth with a viscosity and weight to it that many will love, finishing expansive if just a little hot.